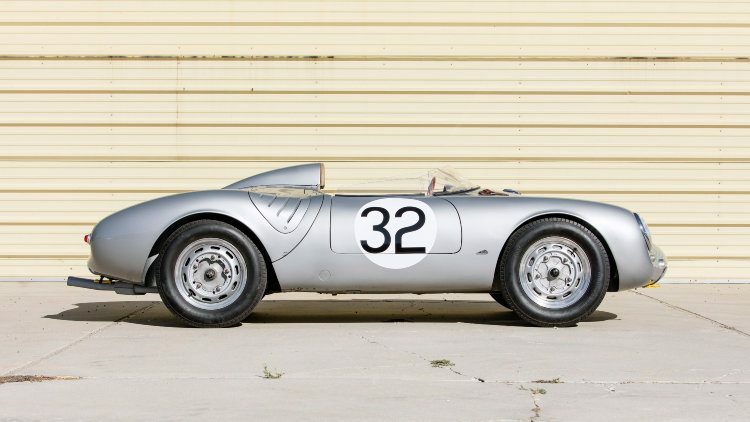 A 1958 Porsche 550A Spyder that finished fifth overall at Le Mans as a works entry sold for $5,170,000 as the top result at the Bonhams Scottsdale 2018 sale. The 2018 classic car auction year started well for Bonhams when almost all of the top cars on offer at the Scottsdale, Arizona, 2018 auction sold within estimate. 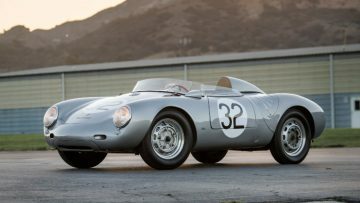 The top result was as expected for the 1958 Porsche 550A Spyder that finished second in class and fifth overall as an official works entry at the Le Mans 24 Hours race. It sold for $5,170,000. The top Ferrari result at Bonhams Scottsdale 2018 was $2,640,000 for a 1972 Ferrari 365 GTS/4 Daytona Spider. A Ferrari F40 sold for a very strong $1.512,500 while a less than perfect F50 achieved only $1,155,000. A relatively high mileage 2015 Porsche 918 Spyder sold for a relatively low $1.292,500. The first 1957 Mercedes Benz 300 SL imported into the US sold for $1,512,500 – one of the best results for over a year. A 1930 Bentley Speed Six Le Mans Replica Tourer sold for $1,457,5000 – well above upper estimate. Bonhams seventh annual Scottsdale auction was held January 18, 2018, at the Westin Kierland Resort & Spa, in Phoenix, Arizona, USA. In 2018, Bonhams earned $25.2 million with 94 of 108 lots offered sold – a sell-through rate of 87% and an average price of $267,649 per car. In 2017, Bonhams earned $36 million from just over 100 cars with sell-through rate of 82%. The top result in 2017 set a model record for a Jaguar E-Type Lightweight Competition ($7,370,000) – it was also the most-expensive car sold in Scottsdale in 2017. Results, including premium, as announced during the auction. Exclude post-hammer deals. 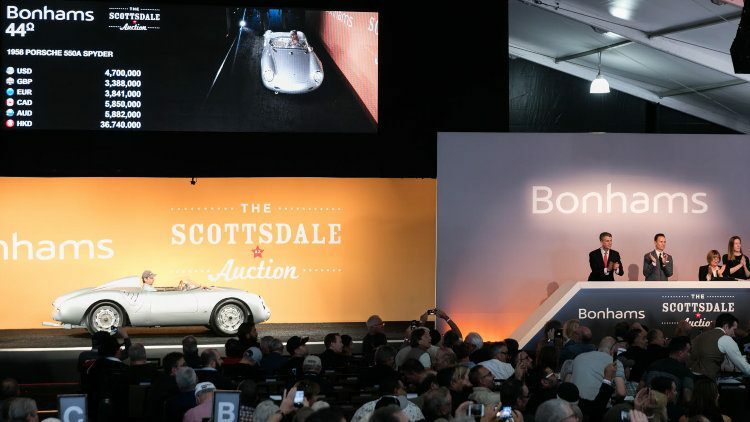 The top result at the Bonhams Scottsdale 2018 sale was as expected for the 1958 Porsche 550A Spyder, chassis 0145, that sold for $5,170,000. This set a new model record although Jerry Seinfeld’s 550 sold for slightly more at Gooding Amelia Island 2016. This 1958 Porsche 550A Spyder was the second last of 40 produced but its claim to fame is being a works entry that finished second in class and a magnificent fifth overall at the 24 Hours of Le Mans race. This 550A was an official Porsche Works entry and driven by its owner Carel Godin de Beaufort to the best result ever for a 550 at Le Mans. The 1958 Porsche 550 A Spyder was also a class winner at the Nürburgring 1000 km. It was also raced at the 12 Hours of Reims, the Zandvoort NAV race and at the Dutch Grand Prix. The Porsche 550 A remained in a well-maintained condition and more recently participated in ten consecutive Mille Miglia Storica races. The Porsche was previously offered at Gooding Pebble Beach 2016 where a highest bid of $4.2 was not accepted. The final bid at Scottsdale 2018 was half a million dollar higher. 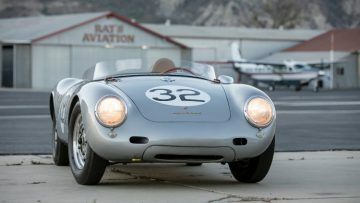 See also 1958 Porsche 550A Spyder Announcement for more on this car and results for Porsche 550s at recent auctions. 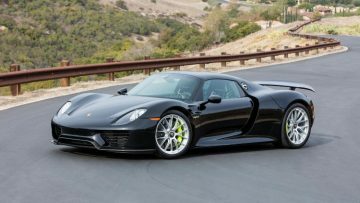 At least four Porsche 918 Spyders were on offer at the various Scottsdale 2018 auctions. The 2015 Porsche 918 Spyder at Bonhams had the lowest pre-sale estimate and sold for $1,292,500. Although the result was within estimate, this was by far the lowest result for a 918 at auction. This black 2015 Porsche 918 Spyder had a relatively high mileage for the model at 2,278 miles. Many 918s come to the market with well below thousand miles. The car was the 290th of the 918 produced. 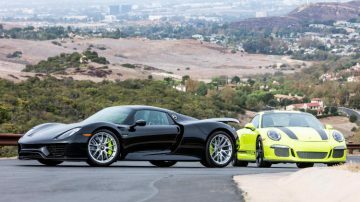 The same owner also offered the 290th 2016 Porsche 911 R produced of a production run of 991. This car has covered only 38 miles. It sold for a mid-estimate $478,500. 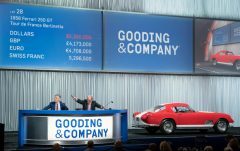 Bidding for the 1956 Porsche 365A 1500 Carrera GC Coupe, estimate $750,000 to $900,000, fizzled out well short of $600,000. The 2005 Porsche Carrera GT was withdrawn. The top Ferrari result at the Bonhams Scottsdale 2018 sale was $2,640,000 for a 1972 Ferrari 365 GTS/4 Daytona Spider. This car was the 72nd of only 123 Spiders built by Ferrari of the popular Daytona model. The second highest price paid for a Ferrari at Bonhams was $1,512,500 for a 1991 Ferrari F40 – one of the best results ever for an F40 at auction. This F40 is one of 213 delivered in US specification and was helped by having only 2,500 miles on the clock. Somewhat surprisingly, the only Ferrari F50 on offer at the various Scottsdale, Arizona, 2018 auctions sold for less. The 1995 Ferrari F50 sold for only $1,155,0000 – the lowest auction result for an F50 since at least 2014. The car was the final of 55 produced for the US market and one only two black cars in US specification. However, the car was enjoyed for a good 60,000 miles and had suffered a front-end accident that had been repaired and inspected by Ferrari. Bidding for the 1967 Ferrari 275 GTB/4 stopped at $2.65 million – just shy of the estimate $2,800,000 – $3,400,000, so a post-hammer deal certainly looked possible. This magnificent yellow 275 GTB/4 retained its original interior and is a low-mileage US specification car with only 32,000 miles on the clock. This was the only car with a million-dollar estimate failing to sell at Bonhams Scottsdale 2018. A 1973 Ferrari 365 GTB/4 Daytona received a highest bid of $720,000 – although relatively high for a Daytona Berlinettta, this was too low for a car in this professionally correct restored condition and with only 32,000 miles on the clock. At least seven Mercedes Benz 300 SL cars were on offer at Scottsdale 2018. The Roadster at Bonhams was the first to go under the hammer and it was a good one. The 1957 Mercedes Benz 300 SL Roadster sold for a very strong $1,512,500 – the second highest Roadster result in the past twelve months. It was the first Roadster imported into the USA and the fifth one built. It is a matching numbers car and had a single owner for five decades. It was restored in 2013 at a cost of nearly half a million dollar. The 1930 Bentley Speed Six Le Mans Replica Tourer sold for a stunning $1,457,5000 – double lower estimate and half a million more than upper estimate. This 1930 Bentley Speed Six was originally fitted with a flexible saloon body by R. Harrison & Sons but was changed to a Le Mans style body in the 1980s. The next major Bonhams motorcar auction is the Les Grandes Marques du Monde au Grand Palais sale in Paris in February 2018.